No matter what you call them, Trash tags, Refuse labels, Garbage tags, Service stickers, or Universal tags, these stickers are the most commonly used labels in pay per use and pay as you throw programs in North America. 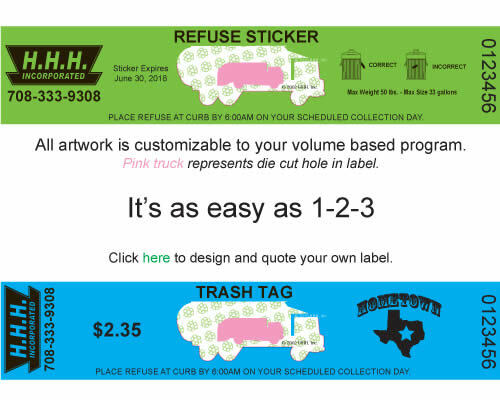 Our trash tags include back text at no extra charge and the sticker backs are a great way to advertise your company's holiday collection schedules, pick up times, online bill pay programs and other waste collection program information that is pertinent to your customers. Stop Label Counterfeiters Tip - Do not place town logos or company logos in pdf files online. PDF files allow vector builds of your logo to be grabbed by label counterfeiters for use on counterfeit labels and other counterfeit documents.